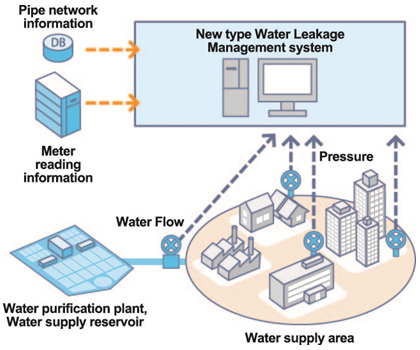 Tokyo, June 10, 2015 --- Hitachi, Ltd. (“Hitachi” / TSE:6501) today announced that starting today, it began sales of a new type of water leakage management system for use in emerging countries, including those in Southeast Asia. The system utilizes information technology (“IT”) to estimate areas with large amount of leakage in water pipe networks, thereby streamlining water leak management operations. Hitachi plans to extend sales of the system as a key product in its water environment solutions business, and to further strengthen and extend its global development. The system uses Hitachi's proprietary simulation analysis combining sensor information, asset information, and hydraulic analysis*1 technologies to virtually divide the water pipe network and then estimate small areas with large amount of leakage. The system enables operators to estimate water leakage in small area units before commencing operations to identify leak points in the field. This identifies which areas the operator should focus leak countermeasures in, helping them to conduct water leakage management operations efficiently. Moreover, installation of the system requires installation of only a minimal number of new sensors, thereby keeping installation costs low. These features contribute to efficiency gains for operators in managing water leakage, as well as higher earnings due to reduction of leakage. The system was test-bedded in a series of field experiments from August 2013 to September 2014 in PUB's water distribution network. PUB manages the entire water cycle in Singapore, from rainwater collection and the purification and supply of drinking water, to the treatment and reclamation of used water. PUB also conducts advanced research and development in water technologies and offers opportunities for water companies to test-bed their solutions at its facilities under actual site conditions. In emerging countries, the rates of non-revenue water*2 including water leakage are high while the construction of water purification desalination plants is proceeding in conjunction with population growth and economic development. In some parts of Southeast Asia, the rate exceeds 30%*3. High non-revenue water rates depress the earnings of water business operators, and are a factor causing higher water supply prices. There is also the risk of foreign matter entering the water supply from the leak points and degrading water quality. Leakage is therefore an issue that requires urgent attention. Currently, a commonly used method for specifying leak points is to temporarily close the valves during nighttime and use field operations such as measuring flow volume. Recently, there have also been a number of systems developed that use sensor information to detect leaks from phenomena such as pipe noise; however, such systems present challenges in that they require high-density installation of a large number of sensors and are not easily able to detect leaks in some environments, regardless of the scale. Hitachi has developed a water leak management system that performs simulation analysis that uses IT to combine hydraulic analysis technologies with asset information such as materials used to construct the water pipes, years since installation and aging, and flow and pressure information from sensors attached to the water supply pipe network. The system compares actual values for flow and pressure measured by sensors against values calculated in a hydraulic analysis simulation that takes into account the distribution of aging pipes to estimate small areas with a large amount of water leakage. Since it estimates the overall leakage amount for each small area rather than estimating the position and scale of individual leaks, it can estimate areas with multiple leaks regardless of individual leak size, making water leak management operations more efficient. Furthermore, the system can be installed at low cost since the minimum configuration requirement is a flow rate sensor and a water pressure sensor at the inlet point of the water supply area and a pressure sensor for each small divided area. In field tests conducted by Hitachi, an experiment was carried out where water was discharged from fire hydrants to simulate leaks in order to verify the effectiveness of the system. Under a condition where 3.5% of the average water supply volume was released from one identified area, the system was able to accurately attribute the increase in consumption from the simulated leak in the water release area. The system was successfully applied while only using readings from a selected few installed sensors in the tested water supply network. Moreover, information on the aging of water pipes, which is analyzed and utilized by the developed system, can be effectively used not only for water leak management, but also for asset management, such as planning upgrades for water pipe networks. Hitachi plans to market this system proactively in countries where water leakage rates are an issue, in tandem with its Water Distribution Control System*4 and other offerings as it further accelerates the global development of its water environment solutions business. Hydraulic analysis: technology that estimates water flow rate, flow speed, and pressure by simulating water flow within a water supply pipe network. Non-revenue water rate: the ratio of water volume for which revenue is not received because it does not reach users due to leakage, theft, or other reasons, with respect to total supplied water volume. Water Distribution Control System: a proprietary system of Hitachi that achieves energy saving on water supply pumps and reduces leakage by collecting data from water pressure and flow rate sensors installed across a water supply area and performs real-time pipe network analysis and optimization calculations in order to calculate the optimal water pump outlet pressure and carry out automatic control.